Amelia, aka "Princess" aka "Pukey" aka "Butthead"
Mama left her iPad unlocked so I wanted to say hi to my "blog followers." I don't know what that means, but she wakes me up from naps to take pictures for them, so HI! Excuus my spelling. I don't have thumbs. We moved and now we live on a "bote". (We drove a long way in a "car", which sucked, and for some reason never went to see the "VET", which is what usually happens). We don't have grass anymore and I can't see out the window so Daddy let's me go out in the "cockpit" to lay in the sun instead. I see birdies and sometimes Mama says, "Amelia, did you see the fish?" That's crazy. Fish comes in cans. Sometimes Dad comes out and drops tools on me, says bad words and throws me back inside. I don't know what his problem is. If I sleep in the middle of the floor, there should be plenty of room to work around me. Mama says "Don't let her out in the cockpit so much." I don't know what she's worried about. One time I went out to do "anchor watch" with Dad and got locked out in the middle of the night for 4 hours and I was fine. 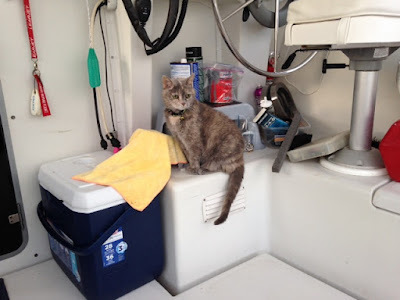 Mama says, "I don't want to know what she did out there for 4 hours." so I probably shouldn't tell. (I took a nap.) All I know is, instead of prowling the house all night, now I stay up and do "anchor watch." I haven't seen any anchors yet. Somebody should probably email me a picture. I stay up until Mama makes my breakfast, even if I'm not hungry. Sometimes she gets busy making "espresso" and forgets, so I keep an eye on her. I'm tired of the food Mama bought. I told her to go get more but she said, "It's a 10 mile bike ride to the pet store. Eat that if your hungry." 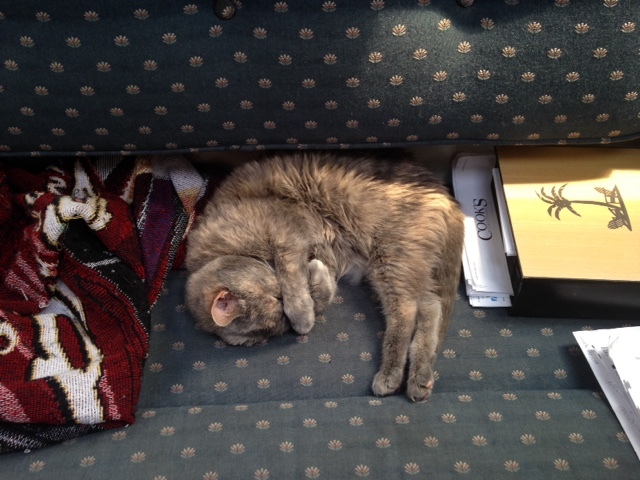 Blah, blah, blah--DIFFERENT CAT FOOD or I puke on the "settee" in the "salon". I used to have a water dish next to my food bowl, but Mom & Dad keep their drinks on the table, so now I have my own "Tervis insulated tumbler" because apparently, Mama doesn't like to share. Sometimes it's bumpy in our house. My friends at the Facebook page, Gatos del Mar says this makes them "sea sick." I don't know what that means, but I also have friends in California that have "earthquakes" so maybe that it. I usually sleep through it. I'm supposed to be the Navigator. I don't really want to do that. I'd rather take a nap. We also have a "dingee"--sometimes Mom & Dad get in it and leave. I keep an eye on it because I think it's an ESCAPE POD and I may take it for a spin some time. Dad asks me once if I want to "drive" the "bote". Looks hard. I'd rather take a nap. Now we are at a "marina". Sometimes a dog walks by! Where did he come from? Well it all went to her head and now Clyde is emailing pics of lobster! Great.